This table has seen some pretty great times in its 42-year history with Mack and me. It was the first “real” piece of furniture that we bought when we graduated from college, planning a care-free, upscale life of fun and frivolity. As goes the plan for many young folks, ours has not turned out to be so carefree. And, I wouldn’t change it for the world. With each struggle and each setback, we have learned and grown – and had a lot of fun in the process. The table started its stint with us in Houston, a couple of weeks before graduation. We were still living in our tiny college apartment; not even enough room to unpack the table from its wrapping. It made its way to a great, airy, historic apartment over on Maple Avenue, in the Turtle Creek area of Dallas, where we hosted many a fancy dinner party as a young couple. It followed us to our first house in Duncanville, where we dined with our babies, one after the other, as they joined us in a high chair. It went with us to the big old farmhouse in Midlothian where we hosted family Christmas and Thanksgiving dinners and Sunday lunches with our growing boys. The table went to Vegas and Los Angeles and on to Denton, where this story really begins. By this time, we had many miles on us (and the table). We had just turned 49, the kids were all grown and gone – still in college or grad school, but out of the house. Mack got word that his division of the company was being shut down that spring, and I was disenchanted with academic life. We needed a change. We barely recognized each other, commuting 2-3 hours each day, and falling into bed with an exhausted nod every night. We didn’t have a plan. But, the Good Lord did. To say the least, we were a bit taken aback. We had leased houses in Vegas and LA, but the last time we had tried to sell a house (the big old white one in Midlothian), it took 7 years! “We will talk about it tonight and get back with you,” Mack told the realtor, shutting the door. By Thursday, the house had sold, papers were signed and we were officially homeless and without a plan. What to do? That Saturday morning, we decided to take a quick trip to Crystal Beach – the site of family reunions for many years and a place that I dearly loved. Mack and I had always planned to buy a beach house, “someday.” Someday, when the kids were out of college and our jobs were settled and we were ready to slow down. Someday was not that day. Not in the plan. But, as I mentioned earlier, the plan does not always work out…well, as planned! Since we had to be out of our Denton house by the end of the month, we were in a bit of a panic. Mack came up with the great idea of going ahead and purchasing a beach house, something that we always wanted to do at some point, and live there for a few months while we decided what to do with the rest of our lives. Later, it would serve as a place to live when we retired – decades down the road – and as a place for the kids to visit during summer vacations. It made sense. We picked out a house on that same Saturday, from an inventory of 4 in our price range, chosen primarily because it was the only one with a dining room big enough for the table. We made another plan-ish and headed home to pack up. As an aside, Jack was 21 years old at the time and our only kid who still claimed to live with us (when his classes at Baylor ended for the summer). That summer, he was studying in Spain, and he will never let us live down the fact that we sold his home right out from under him. He only found out about the situation when we drove up to the SOLD sign on the house after we picked him up from the airport. (Perhaps we could have handled that part a bit better:)) He got us back by listing “unknown” for his hometown in his Law School Graduation bulletin. We moved in on July 17, 2004, still a bit in shock from the whirlwind that this all had been. Jack went back to Baylor for the second summer session and Mack and I spent early mornings swimming in the Gulf, days writing and working (I had just signed a contract to write a textbook and Mack was finishing up some work for the closing division and starting his own consulting business). It was all very bizarre. We didn’t quite know what to do with all that extra non-commuting time, and we really weren’t quite sure what to do with each other. As I often say…it could have gone either way! Mack was in charge of lunch – usually a peanut butter and jelly sandwich with a pickle and chips. I was in charge of dinner (but I will admit that we ate out a lot). After lunch, we would head back down to the beach and swim for another hour or so, then come home to those delightful outdoor showers that we all have at the beach and another few hours of work. Despite the fun, we were getting more work done than ever before. We began the most life-changing, life-affirming years of our lives at Bay Vue United Methodist Church. It was small and friendly. It was a “hugging church.” If you knew me before-the-beach, you know that I was not much of a hugger. I mean, REALLY not much of a hugger. Our first Sunday at Bay Vue started with one of the greeters declaring, “We are a HUGGING church,” and leaning in for a big one. I told Mack that afternoon, that I thought I had died and gone to hell. That hugging thing got to be a positive pretty quickly, as we fell in love with the people and our lives on the peninsula. My now BFF Linda drafted me to do a Scottish dance at the Christmas cantata (you would have to be there), then Mack and I both joined the Way Off Broadway Players that next summer, and the rest, as they say, is history. Mack, the staid, boring engineer (he often said that if he’d had any personality, he would have been an accountant) came alive on the stage as “Sign Man.” Our director, Linda, cast me in wonderful, fun roles based primarily on my willingness to take them and my status as her BFF. Thus started a ten-year fairy tale existence for us. The peninsula is a fun place. Everyone who lives here has a great story. You don’t just end up on the beach with no background story! We went to countless dinner parties, bonfires on the beach, dances and parades. Our time at the church was precious. I can honestly say that I looked forward, each week, to the opportunity to go to church for a variety of meetings. We traveled a lot and even took up part-time residence in Montana for some work. But we always found our way back home to the beach that we loved. We kept the beach house, but our time here got less and less. We still loved our friends and the fun of the beach. We were still engaged in Linda’s fabulous plays and enjoyed the church when we came down. But of course, it wasn’t the same. We were having lots of a different kind of fun up in Midlothian, where we “partied” with our baby boys, went to soccer and baseball games and Cub Scout camp-outs. Our parades were now in the back yard, with Coby leading the charge with a Texas flag and Mack bringing up the rear with his iPhone blaring “Texas Our Texas.” Equally great times. Saturday night, we hosted our final (for a while anyhow) beach-y dinner party at this table. 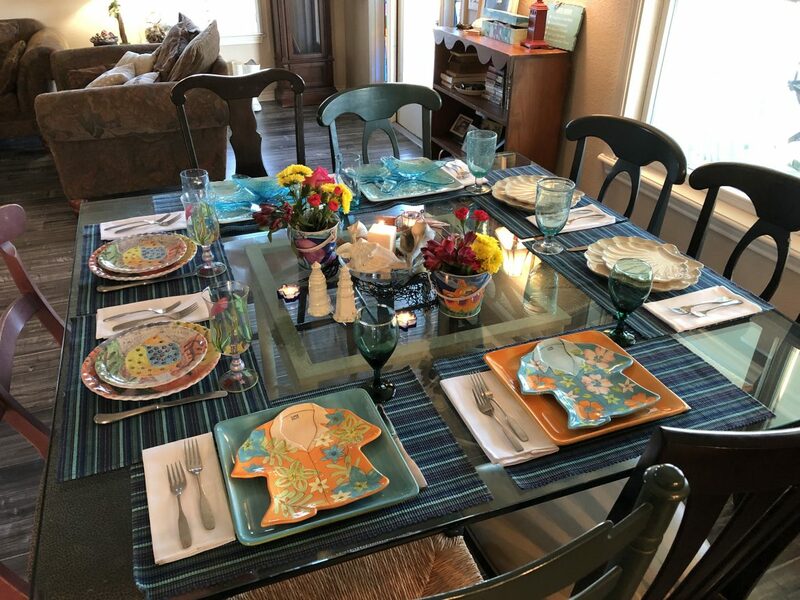 As we joined with dear friends, people who have meant so much to us over the years, the spirit of all of those we have enjoyed around this table during the past 15 years came to mind. I was transported back to the Russian-themed party held with the Gr8888 – four couples who were inseparable in the years before Hurricane Ike. We laughed and laughed that night, eating Beef Stroganoff and dense black bread. We answered the Noble Call – I performed my only talent – the recitation of the Prelude to the Canterbury Tales in Olde English. Marcel sang The Merry Minuet (They’re rioting in Africa, They’re starving in Spain. There’s hurricanes in Florida, And Texas needs rain!) Karen regaled us with some Russian dialogue and Byron, our kind and quiet war hero, belted out Sixteen Tons. Linda did a little jig,1920s style. Doug and Betty taught us all to hang spoons from our foreheads. Mack (the engineer) did not have a talent that night, much to his dismay. I suggested that he might give a slide rule demonstration. He does not find me nearly as funny and charming as I find myself. Family reunion dinners, holiday meals, dominoes, cards, and crafts. Countless peanut butter and jelly sandwiches. I wrote three books at that table, glancing up occasionally from my computer to see the beach, loving every minute of this life that we almost missed. As our party came to a close, I couldn’t help but be a bit sad. We would sign the papers to put the house on the market the next day. Of course, it’s the right thing to do. Having a house – especially one on the beach – sit empty for 2-3 years while we are in Korea makes no sense. But, it’s hard. In this house, around this table, we found ourselves. This place saved us. Mack promises that we will build a new one after Korea. “We’ll build a bigger one,” he said. “We’ll build a better one,” he said. “Awww. Don’t cry,” he said.